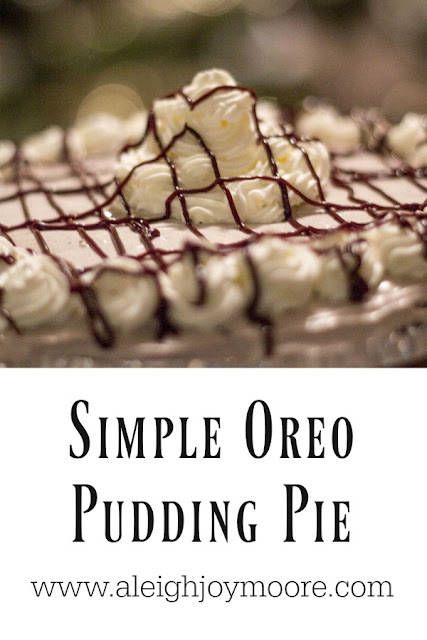 Tasty Tuesday: Oreo Pudding Pie | For the Joy of Life. In the spirit of Thanksgiving this week, I figured I needed to post a pie recipe! To be completely honest, I don't love pumpkin pie. I don't mind a berry pie but I definitely wouldn't choose it. When I met Hunter, I quickly found out he's a fan of all things cookies and cream. Seriously though, I haven't found one cookies and cream flavored thing he doesn't love. I also found out pie is probably one of his favorite desserts. 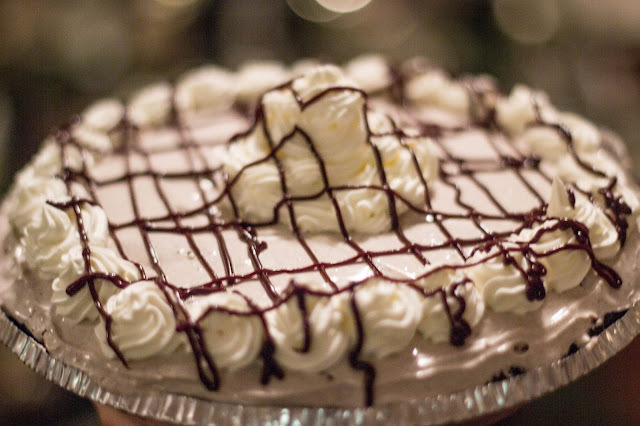 So, I just had to come up with a cookies and cream pie! He's a huge fan of banana cream which is like the easiest of all pies to make... so I went with that only Oreo flavored! Just like that, this ridiculously easy Oreo Pudding Pie was made up and instantly became a favorite in this household. So make this pie for dessert this year... you won't regret it! 1) Whisk the pudding mix and cold milk for about 2 minutes just as the package says. Then, let it set in the fridge for 5-10 minutes. 2) Warm your hot fudge. Spread it over your cookie crust until it has a somewhat thin layer. The crust easily breaks so the more runny your hot fudge is, the better off you are. 3) Once the pudding has set, take your unfrozen cool whip and fold it into the pudding. Next fold in the Oreo cookie bits. 4) Put all the pudding goodness into the shell and let set, covered, in the fridge for a few hours. 2 wasn't quite enough so next time I'm sticking with 4-6. 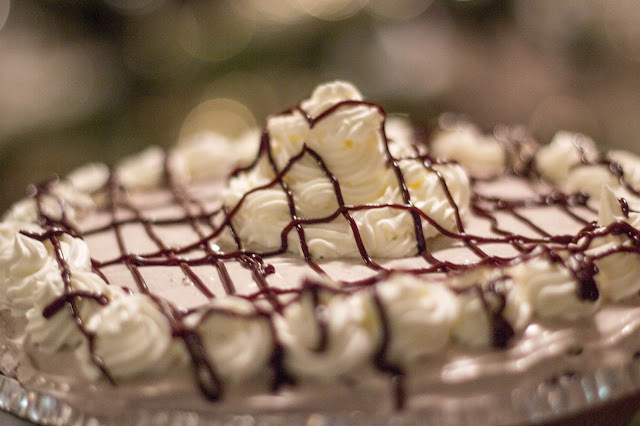 5) Decorating is optional but once the pie was set I drizzled some more hot fudge over the top and garnished with whipped cream. You can never have enough whipped cream! Seriously guys, such an easy pie to make! Nice blog i have not discovered one cookies and cream flavored issue he doesn't love. I additionally discovered out pie might be one in every of his favorite desserts. So, I just had to give you a cookies and cream pie! he is a big fan of banana cream which is just like the simplest of all pies to make. I'm working in write my essay so I went with that only Oreo flavored! similar to that, this ridiculously clean Oreo Pudding Pie was made up and instantly have become a fave on this household.